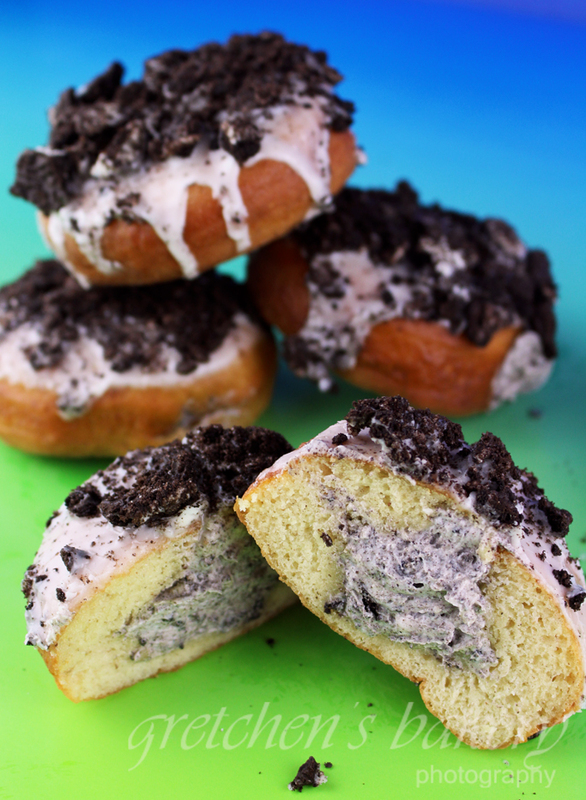 Do these new Vegan Oreo Cookies and Cream Donuts even need an introduction? I mean the name and the picture say it all! These are definitely in the style of Krispy Kreme since they are filled to the brim with luscious Oreo buttercream. For those who are not familiar with Krispy Kreme Donuts, hmmm…. well there is a sort of “donut culture” that you will have to get yourself up to speed about; and you are either on the side of Krispy Kreme’s or the Dunkin’ Donuts Variety. The great thing about this recipe though is you will never have to buy another donut from either of those above mentioned! Homemade donuts are amazing! There is nothing quite like a freshly fried donut filled with homemade buttercream! Of course the process of making donuts is not really beginner baking, and getting that oil to almost 400°F can be dangerous business. However with some patience and at least a few hours you will be in donut heaven, trust me! This is a building on recipes project since the donut dough is one recipe and the cream filling is another one. In a mixer fitted with a dough hook attachment combine all the ingredients including the frothed yeast/milk mixture EXCEPT FOR OIL~ the oil is for frying the donuts! Scrape the bottom and sides of the bowl to help it along and mix on low to medium for 8 more minutes on medium speed. After 30 minutes, fold the dough over onto itself and continue the rest for another 30 minutes. Transfer the donuts to a parchment lined sheet pan and allow them to rest for 15 - 30 minutes while you heat the frying oil. Finally vegan fried donuts!!!! Whoop whoop!! Quick question. So I don’t have a dough hook. Could I use the paddle rather than my bare hands. I’ve kneaded donuts by hand before!! Phew! Hard work!! Brilliant!! Will let you know how it all turned out! My digital scale just decided to die, so I’m having to measure everything using measuring cups and measuring spoons!! I’ve never done one of your recipes this way!!! Aaaahhh! Brilliant!!! My friends were shocked when I said that they were vegan! Success!!!! You are amazing!!!!! !